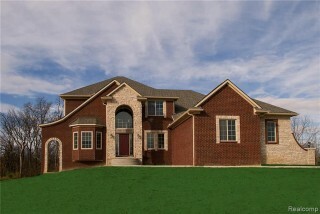 WALNUT CREEK LOT 8 DORCHESTER FLOOR PLAN. ESTATE-SIZE LOTS IN GATED COMMUNITY. COLONIAL FLOOR PLAN FEATURING 4 BEDROOMS 3.5 BATHS. 2 STORY FOYER WITH CURVED STAIRCASE. LIBRARY WITH DOUBLE DOORS. FORMAL DINING ROOM. HUGE GOURMET KITCHEN WITH BUILT IN OVEN/MICROWAVE, GAS COOK TOP, AND CHIMNEY STYLE HOOD. LARGE KITCHEN ISLAND. WALK IN PANTRY. FAMILY ROOM WITH GAS FIREPLACE. 2ND FLOOR LAUNDRY. MASTER SUITE WITH WIC AND ADDITIONAL HANGING CLOSET. MASTER BATH WITH FULL TILE SHOWER. JACK AND JILL BATH AND PRINCESS SUITE. BONUS ROOM INCLUDED FULLY FINISHED. WALKOUT LOT. DEEP POURED BASEMENT PREPPED FOR FULL BATH. CENTRAL VACUUM AND SECURITY SYSTEM INCLUDED. All information provided is subject to change and not guaranteed to be accurate. All information should be verified.